I write from a small island over 2,000 kilometres from mainland Europe. Probably, without it being my intention, my islander status offers me a singular perspective on a world that on most occasions causes me puzzlement and uneasiness. I think that many of my characters, whether they are based on a real reference point or purely imagined, face this same perplexity: they are overcome by events, they find themselves immersed in situations that they do not understand, and they act in a contradictory way. With my writing I do not try to understand the world that surrounds me. My only intention is to endure, with difficulty, that perplexity that reality produces in me day after day. 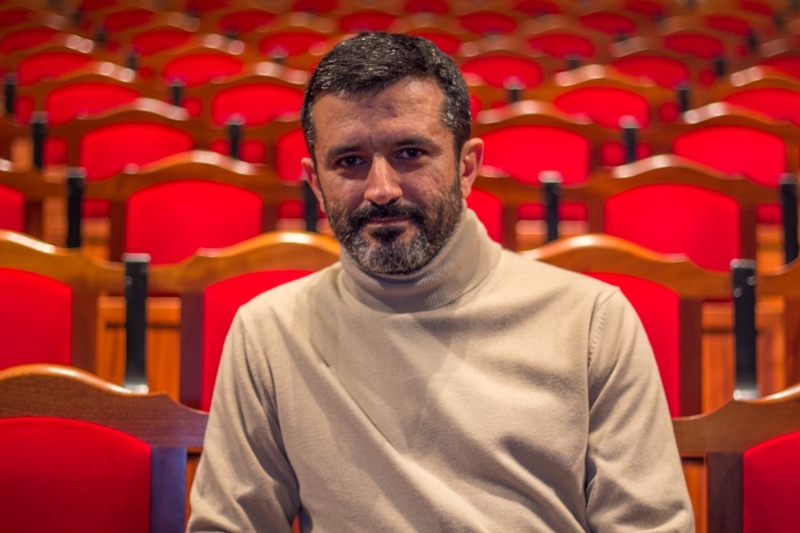 A graduate in journalism from the Complutense University of Madrid, he has attended different playwriting workshops with authors such as José Luis Alonso de Santos, Paloma Pedrero, Alfonso Plou, Ignacio Amestoy and José Ramón Fernández. He is the author, among other works, of La punta del iceberg (Tirso de Molina Ibero-American Prize, premiered in 2014 at Teatro de la Abadía in Madrid and directed by Sergi Belbel), Una hora en la vida de Stefan Zweig, Cuarteto para el fin del tiempo, Canarias (special mention by the jury of the Calderón de la Barca Prize) and La sombra de don Alonso, all of them staged and/or published. A large multinational company is shaken by the death of three of its employees. Sofía Cuevas, a company director, is in charge of carrying out an internal investigation to try to discover what happened. In her meetings with the workers, she gradually uncovers a very unhealthy working atmosphere: a pathogenic form of management where the individual is relegated to an insignificant role and the only priority is the balance sheet. But, is there something more? What are the real reasons that lead a man to take his own life while at work? A play about the deterioration of human relations in a competitive and hostile work environment. On 22 February 1942, in exile in Brazil, Austrian writer Stefan Zweig took his own life together with his second wife and secretary, Lotte Altmann, 25 years his junior. This work recreates, in a fictional key, the final moments of the author of Carta de una desconocida. While the Zweigs prepare their suicide meticulously, an exiled Jew, a new arrival from Europe, turns up at the house. Who is this strange and inopportune visitor? What is his secret? Quatuor pour la fin du temps (Quartet for the End of Time) by Olivier Messiaen is one of the great chamber compositions of the 20th century. It was premiered at the prisoner-of-war camp in Görlitz, in Silesia, during the Second World War. Based on the tale told by its protagonists, Cuarteto para el fin del tiempo freely recreates the process and circumstances that surrounded the composition of this piece, in which we come to glimpse the immense liberating power of that intangible and mysterious phenomenon that we call music.